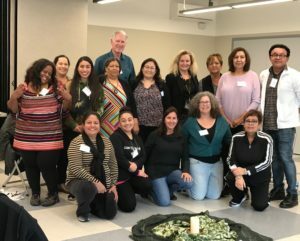 On Saturday March 9th, Healing Hearts Restoring Hope partnered with Restore Justice and the Los Angeles County District Attorney’s office to offer a Personal Retreat Day for victim/survivor support group leaders and victim advocates. delicious lunch made by a member of the Dolores Mission community. The day ended with a discussion about community needs and opportunities for collaboration and support. Participants agreed that they want to continue meeting together for support and learning. The day was facilitated by Consuelo Valdez, Rita Chairez, George Horan, Connie Arambula, Rebecca Weiker and Suzanne Neuhaus.